Probably the coolest uses of Kinect in advertising out there. 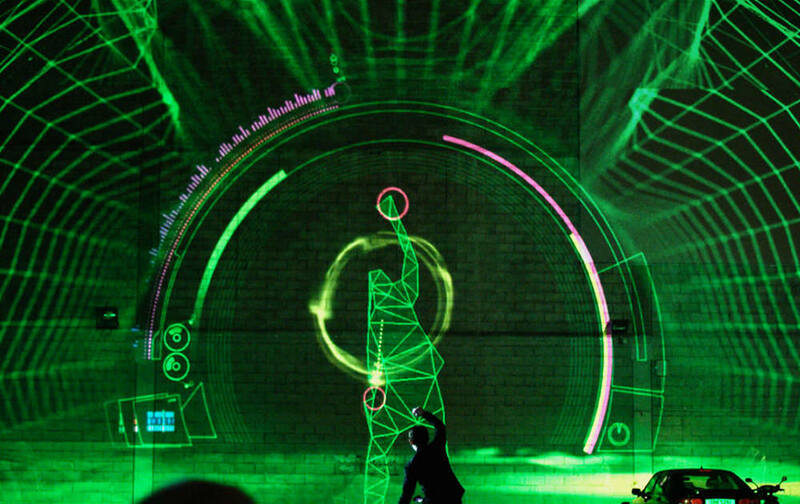 The V Motion Project utilises body movement to control sound and visual effects for an amazing Dubstep performance. Made by ColensoBBDO, Assembly, Fugitive, Joel Little and James Hayday. Why not see how they did it, or check out their performance at The Dark Knight Rises premiere. This one’s not a hack, but it’s definitely inspired by the V Motion Project above. Harmonix are currently developing a game to let you move to control the music, based on the Disney Fantasia franchise. The Nike FuelBand is an amazing device that tracks your movement throughout the day with it’s simple LED pixel interface. To promote the device, the amazing team at onformative created a beautiful pixel-based motion capture installation at the Boxpark pop-up mall in London. Firewall is a beautifully unique art and music installation that allows the audience to interact with an elastic membrane, which ripples and sparks with every touch. Created by Aaron Sherwood and Mike Allison, this is one of the finest Kinect examples I’ve been able to find that provides the user with a tactile surface in which to interface with the device. In this installation for children, a beautiful nocturnal forest lights up when motion is detected. The game of hide and seek allows for the playful discovery of all the woodland creatures hidden in the dark. This wonder was created by design I/O for Bumble. If you like their stuff, then also check out Puppet Parade. Chaotic Moon are an awesome company with an equally awesome tech demo. The Board of Awesomeness uses video, speech, location and accelerometer readings to respond to the control of the rider without a controller. This project was based in La Rambla, Barcelona, and blended street performance and 3D printing to produce an innovative installation, where participants can create a souvenir of their moment in the spotlight. It was produced by the team at blablabLAB. Absolut are known for their ties to the art community. This interactive installation allows users to become part of the fun and creative Absolute bottle art. Created by Phormatik in Bulgaria. This amazing work was created by Daniel Franke & Cedric Kiefer. They were able to create a moving 3D sculptural form with an amazing sand-like deconstruction by tracking a contemporary dancer from numerous angles. Below is the documentary showing how they did it, along with the final work. This diploma work by Michal Ščuglík turns the world of Twitter into a 3D environment, where human silhouettes are generated by tweets and your actions move you through the scenery. This installation was developed for The Creators Project (a partnership between Intel and Vice), and uses swipe and touch events to control a huge Instagram feed projected in a gallery space. This huge store-window installation really grabs the attention of the passing audience through a mix of video, interactive animation and sound effects. Created by Posterscope. Construction panels were lining the sidewalk of a street in Hornstull, so the talented team at Abby Norm decided to create a stylish interactive forest to liven up the space and make it more exciting and fun than disruptive. Who says kiwi’s can’t fly? This soaring adventure by Lumen Digital will have you gliding around a 3D island collecting coins and enjoying the view. I hope you enjoyed this Kinect inspiration roundup. If you have any projects you think should have made the page, please let me know in the comments below so I can add them to the next inspiration post.